I was impaneled as a juror in a civil case. For this privilege, I got paid a whopping $5 per day—which, if that wasn't insulting enough, is considered taxable income. OK, New Jersey is on the low end of juror pay. In Maryland, jurors get a whole $10.50 per day. 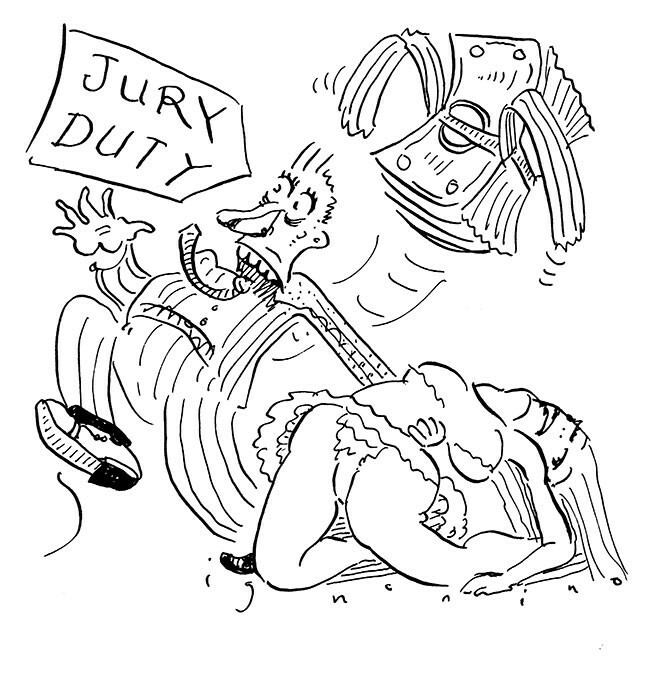 Why is jury pay so low? Heck, at least you showed up. One study found that 80 percent of prospective jurors in Dallas County, Texas, simply ignored their summons altogether. And who can blame them? I don't know your specific economic situation, David, but I can think of a lot of people for whom jury duty's not merely a petty hassle but an unaffordable luxury. I think there's a clear case to be made that any jury system that requires folks to work for 5 bucks a day isn't just annoying, it's plainly undemocratic. Outside the federal system, things are pretty patchwork—some states set the rate, and if they don't, the counties do. Nationwide, pay generally doesn't exceed $50 per day and, as your experience illustrates, is often much lower: as one observer crisply pointed out, "Some counties in South Carolina ... pay jurors minimum wage for an eight-hour workday—as of 1938." That amounts, by the by, to 2 bucks a day. In some states, rates improve the longer you sit on the jury: Pennsylvania, for instance, pays $9 for each of the first three days and $25 daily thereafter. You might get lucky and receive compensation for travel, but on the other hand, you might have to pay for parking: I give you Mobile, Ala., where jurors hearing cases at the county courthouse take home a whopping $10 per diem, plus five cents a mile driven there and back, less the $2 (the special jurors' rate!) they're pretty much forced to put down to leave their car in the parking lot. (OK, Alabama employers are required to pay full-time workers for the days they serve on juries, but that's little help to those Alabamans who lack the security of a full-time job.) And of course there are more invisible costs too, like child care (Colorado and Minnesota do make some provisions for this), canceled vacation plans, etc. As I suggested up top, the implications of this pay regime are pretty brutal. Let's say a person who makes minimum wage (in one of the 40 or so states without laws like Alabama's) is forced to skip work at her full-time job to serve 10 days on a jury, for which she might take home, say, $100—we're looking at a financial disaster. That's why most states allow for hardship exceptions, if potential jurors can prove their service would be an undue burden. In one sense the exception seems merciful. Viewed another way, though, it's downright unconstitutional: Someone's getting excluded from meaningful participation in the American democratic system simply because she can't afford it—which may well, according to a 2015 article in the Cornell Journal of Law and Public Policy, violate the equal protection clause of the 14th Amendment. Another paper, from the Columbia Journal of Law and Social Problems in 2012, argues that because most states link voter registration with jury service, jury duty basically constitutes a poll tax: it's effectively a fee for casting a ballot. Citizens know they'll be put on a jury list if they register to vote; some know they can't afford to miss work to sit on a jury; therefore, they don't register and subsequently can't vote. The paper estimates that up to 7 percent of American citizens are thus disenfranchised and proposes official sources other than voter rolls—tax or DMV records, for instance—from which potential jurors' names could be culled. Of course, that wouldn't address the problem that juror pay is too low to begin with, or explain the root cause. I don't think the reason for this execrable set of affairs is particularly mysterious. You might as well ask: Why are the country's highways and bridges falling apart? What's the reason for rising maternal mortality rates, or growing hunger and homelessness in major cities? What you're seeing is the result of austerity and misplaced political priorities. In Minnesota, juror pay has actually been cut twice since 2003 due to tight state finances; last year, the governor proposed an increase, but his plan didn't make it into the final budget approved by the Legislature. Thus, did the state's pay rate for jurors remain at a paltry $10 a day. But hey, it's a crumbling empire, man. What did you expect? Editor's note: In Utah, the federal court rate is $40 per day; state district courts pay $18.50 for the first day and $49 per day thereafter, and the per diem pay for Salt Lake County Justice Court is $18.50.